Set over two floors, Bentley's restaurant is an absolute gem, well known for its fish selection and with celebrity chef and Irishman Richard Corrigan at the helm. The chef and owner of Corrigan's Mayfair has brought his passion for fresh, quality produce to Bentley's and created a fun and authentic place to dine. If you have a partiality for the odd oyster this is the best place in town. Enthusiastic diners can have the full works - the ritual with chopped onion and Tabasco, the gentle squelchy slip down the throat and the saltwater aftertaste followed by the obligatory gulp of Guinness that restores your mouth to normality once more. The Oyster Bar downstairs is alive with a vibrant buzz and general joviality. Incidentally, the infectious noise and merriment is pretty much restricted to the Oyster Bar but we think thats the idea. The marble, wood-panelled room is full of rowdy, oyster appreciating folk its a lot of fun. Serene, sophisticated and elegant, the interior is made up of blue and whites, warm wood and Bentley's fish prints. The waiters are in tails and the seating space generous. Up at the Grill there is a good balance between fish and meat dishes. No doubt, folk will also welcome the element of foreign influence visible in parts of the menu. The Singapore crab and mussel soup is a big hit. Many of the dishes flaunt their provenance. If you're resolutely keen to eat only Irish produce, the menu lets you know exactly where your smoked salmon originated from, which is always handy. The whole place has been restored by Corrigan and the menu is his brainchild. However, don't expect to catch a glimpse of him gutting fish in the kitchen. He doesn't work here. A deservedly popular venue. Bentley's Oyster Bar and Grill gyms, sporting activities, health & beauty and fitness. The best pubs near London Bentley's Oyster Bar and Grill. 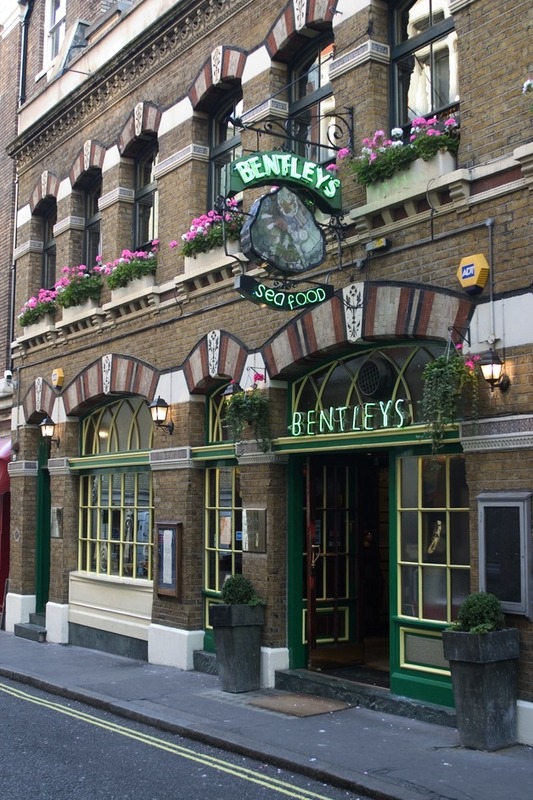 Bentley's Oyster Bar and Grill clubs, bars, cabaret nights, casinos and interesting nightlife. Where to have your meeting, conference, exhibition, private dining or training course near Bentley's Oyster Bar and Grill. From cheap budget accommodation to luxury 5 star hotels see our deals for Bentley's Oyster Bar and Grill hotels, including Cavendish London Hotel from 83% off.